Author’s notes: Thanks to all who have read and/or reviewed Part One. If you haven’t, it might be a good idea to do so. In what I write below, I am vaguely basing dates and events on my own combination of the movie and the original comics. The date I use for Hellboy’s ‘birthday’ derives from the original comics—for some odd reason the movie uses another date. The placing of other significant events in the life of Hellboy on his birthday is my own adaptation of backstory material. Hellboy paced nervously in the large room that had been converted into an office for his personal use when visiting the facility that at one time had been the place he called home. This room opened onto another slightly smaller room that contained his sleeping quarters and bath facilities. It was still quite early in the morning; he had not slept well the night before and was still wearing nothing more than the black shorts he usually dressed in when first getting out of bed. Except for his partnership with Abraham Sapien, Hellboy had suppressed many memories connected to his past life in Newark. The unexpected reminder, on the previous morning, of the personal importance of that day had shaken his ability to block some of the more significant of these memories. December 23rd was the day the infant Hellboy first appeared in 1944. Trevor Broom always looked upon this as Hellboy’s ‘birthday’ and thought the proximity to Christmas Eve of special significance. For almost sixty years, this was a time of special sharing between father and son. Others were eventually drawn into this sharing—especially Abe Sapien and Liz Sherman. Hellboy’s birthday also marked other significant events connected to Liz. It was on this day in 1986 when he first met the eleven-year-old ‘Lizzie’. And it was on this same day eighteen years later that Elizabeth Anne Sherman agreed to marry the personage officially known as ‘Trevor Bruttenholm, III’ on his baptismal and marriage certificates. Liz passed away on December 23rd in the year 2078, after almost seventy-four years of marriage. Unfortunately, the memory of her death tainted what had once been such a special time for him. After Liz’s death, Hellboy found it difficult to allow himself to ever become that close to anyone again. He may have had occasional one-night stands or weekend flings with attractive and willing women; yet, these encounters never even came close to developing into anything long-term. In fact, the only lasting relationships he allowed into his life were with the Bureau agents and other government employees he worked with; but, even with these colleagues, he kept a friendly distance. Continuing his nervous pacing, Hellboy sighed. As long as Abe had still been around him, he could sense a vague, yet unshakable, connection to his past. Abe’s recent departure from the Bureau left him feeling completely adrift, without anchor or support. Coming not long after this new bereavement, the unexpected encounter with the young Trevor Carlton had disturbed Hellboy. He felt an immediate attraction to the youth and not merely because of Trevor’s connection to his past. It was almost as if he was being given another chance to again allow someone to become intimately close to him; and this frightened him more than he liked to admit. Passing back into his sleeping quarters, Hellboy slipped off the shorts; eventually donning black leather pants, tee shirt, and work boots. Regardless of shifts in styles, this had always been his ‘uniform’ of choice over the centuries. The only changes being that the leather and cotton were now synthetically replicated and the boots were much easier to fasten one-handed than his original boots. Forgoing his usual humongous breakfast, Hellboy decided to depart his office and meander through the various maze-like corridors that comprised the underground portion of the Newark Bureau facility. They were not as heavily populated as they once had been before the main Bureau headquarters transferred to Washington, D.C. As Hellboy made his slow way into a now seldom-visited Section 51, the few people located there greeted him with thinly veiled surprise. The only resource in Section 51 that was still in use was the collection of tomes and reference works housed in what had once been Trevor Broom’s office. Since Hellboy never found himself amenable either to research or to much reading, even for pleasure, he seldom made use of this vast library. Outside of the life-sized wooden sculpture of Michael the Archangel slaying Satan, many of the relics and artifacts once located in the library and the corridors outside of it had been relocated to Washington, D.C. They were now to be found within the Smithsonian Institution in a pavilion that had been dedicated as The Professor Trevor Bruttenholm Memorial Museum of the Paranormal. Due to the uncanny or magical provenance of various of the relics, printed materials, and handwritten manuscripts located in Newark, the most unique of these special materials were left in their original location to be used only by people with the strictest clearance. Other works and reference books, whose origins were not so mysterious, were either reproduced in facsimile editions or scanned into a special database and were now also collected in the Smithsonian Institution’s ‘Trevor Broom’ pavilion. The rest of Section 51 had been comprised of the offices and private quarters of Trevor Broom and his closest associates. After the relocation to Washington, Hellboy had all the locks on these replaced with ones that would only open at the touch of his left palm. These rooms were then permanently sealed and he had never entered them again; including the large cement room that had been his own private quarters and the room he shared with Liz after their return from Moscow in November of 2004. During the decades of Trevor Broom’s tenure as director of the Bureau, his office had been kept open at all times; since only personnel with clearance could even get as far as its door. After his death, Hellboy had kept it that way until the transfer to Washington. The office was now constantly locked, but still utilized, at times, by specially designated personnel. One of Hellboy’s excuses for this visit to Newark had been to check on the library and also to arrange for the final sealing of Abe’s quarters, which were still keyed to open at the now departed fish-man’s touch. But that was not truly the real reason for the visit. Hellboy knew this, even though he was reluctant to acknowledge the immense feeling of emptiness that had driven him back to the location of his life together with Liz Sherman. Palming the lock next to the library door, Hellboy pushed it open and looked in. “Decapitated chickens involved again?” questioned Hellboy, looking over the agent’s shoulder at the information on the screen. Owens nodded, turning back to the information he had retrieved. 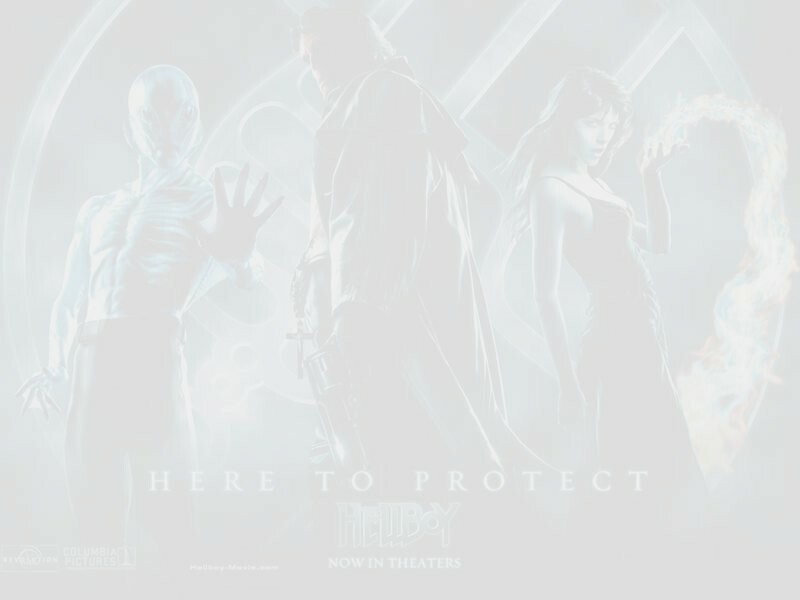 The other agent, Raphael Wilton, was the newest federal employee allocated to the Bureau and had only met Hellboy a few times since he had first been assigned. Consulting information on a hand-held data access terminal, he turned as Hellboy finished addressing Agent Owens. He suddenly reached out with his huge right hand and grabbed the hapless agent up by the front of his dark BPRD-stamped uniform tee shirt. The hand-held monitor clattered to the floor, as Wilton found himself nose-to-nose with a now very angry demon; his feet barely touched the library carpet. Wilton staggered slightly, as Hellboy released him before turning and stalking out of the office. “Definitely safer, Rafe,” Owens said with a grin, as he turned back to the information he was scanning. Still clutching the data monitor in his hand, Wilton pulled open one of the still-beautifully-carved golden oak doors to the library and started out into the corridor beyond. As he set off to depart Section 51 in order to head for his own quarters, he was interrupted by an unexpected voice. “Hey, Wilton, wait up.” Wilton turned to face Hellboy, who had seemed to loom up with little warning from a shadowed corner of the corridor. Turning away from Wilton, Hellboy continued down the corridor toward the large metal door of his former quarters; a door that he hadn’t opened since he had moved to Washington fifty years before. He wondered if he was ready to face what he had locked behind that door—memories that were pleading for him to release them and re-experience the love contained within them. None of these memories held a more fearsome power than his memories of his love for Elizabeth Sherman; and how, to his own profound amazement, she had completely returned his love. He stood for a long moment before unlocking the door. When he finally dragged open the large door and passed through, some lights automatically flickered to life. A brief examination of the room showed that the automatic cleaning and ventilation system he had installed when first sealing the room had worked very well. After pulling the door closed after him, he walked over to the old red pickup truck that he had used for so many years as a bed. Sitting on the mattress still located in the back of the truck, he took a closer look at his former quarters. Nothing had changed since he had last seen it. His old television sets were still there. As most had been gifts from Trevor Broom, he never could bear to discard them; even though most had become nonfunctional long before he stopped using the room. One wall of the room was covered with framed photographs of people who had been important to Hellboy at one time. He himself was in very few of these; but there was one of him as a young child with Trevor Broom, another of him with Trevor Broom and a nineteen-year-old Liz, and the original of the digital photograph shown to him the morning before by Trevor Carlton. He closed his eyes, swearing the room still seemed filled with a faint scent of flowers deriving from the natural cleansing agents Liz had preferred. As sat breathing in a memory that he had spent almost a half a century running away from, he felt a familiar sensation; a cat had just jumped into his lap. Not having had any pets since he moved away from Newark, he should have been surprised at this; yet, he was not surprised at all. First opening his eyes to peer down at this intruder, he then gently stroked the brilliant white fur of the larger-than-normal cat with his left hand. Closing its dazzlingly bright blue eyes, the cat began to purr loudly. “Not since the flight back from Moscow in 2004,” came the answer. The voice, though quiet, filled the entire room; it came from nowhere in particular, rather than appearing to come directly from the cat. Leaping down from Hellboy’s lap, the cat morphed into a tall, slender young man. Hellboy had first met this eccentric incarnation of Michael the Archangel in 1978. Rather than the long hair he had worn then, his radiantly white hair was cropped short into the spiky look currently popular with the sophisticated set. Now dressed in tight-fitting black jeans, midnight-blue tee shirt, and original-style penny loafers, Malachy’s man-like appearance was a lot more solid looking than in the past. Malachy shrugged, “I suppose I could’ve picked up some sandals from ancient Rome or old-style American cowboy boots, but that wouldn’t have fit the look I was after.” Not liking what he sensed, Malachy looked closer at Hellboy. “And here it’s Christmas Eve and you haven’t even hung up one single decoration. You used to love to decorate. What’s up with you? Ignoring the humorous sarcasm, Hellboy’s face spasmed in anger as he noticed what Malachy was hauling out from the corner. It was the odd ‘portrait’ that had come to Hellboy on the Christmas Eve after his eightieth birthday. At the time, he had cherished this mysterious canvas; convinced that in some strange way it had been a gift from his then long-dead adoptive father, Trevor Broom. Regardless of not being completely aware of its true origins, he knew he could always look into its abstract swirls of color and see vivid images of himself with loved ones who had passed on; especially the man who had raised him. At one time, Hellboy would spend hours contemplating this fascinating portrait. In doing so, he could still feel close to all the people he had lost over the years. Disregarding Hellboy’s anger, Malachy propped the large framed canvas against Hellboy’s metal table and drew off the sheet covering it. In spite of himself, Hellboy felt compelled to look at the painting he had not looked at in a century. Expecting to again see the same images of himself with Liz that had so grieved him on the day she died, he was taken aback that he saw nothing but utter darkness. When this portrait had first come to him, he had looked upon it as a magical window on his past; maybe even a small glimpse of that heaven his adoptive father had so believed in. What it now showed looked more like the deepest pits of Hell—cold, bleak, despairing. Hellboy stood completely frozen in that moment of sight, unable to move or speak. “Ah, I was afraid of that,” Hellboy heard Malachy say, as he finally managed to drag his gaze away from that horrifying darkness. He turned toward the being that now appeared to be the only spot of brightness in his room. There was moment of silence before Malachy asked an unexpected question.